Elliott wave terminology for a three-wave countertrend (or downtrend) price movement in an Elliott cycle. Wave “a” is the first down-wave against the trend of the market. Wave “b” is a corrective (upward) wave to wave “a”. 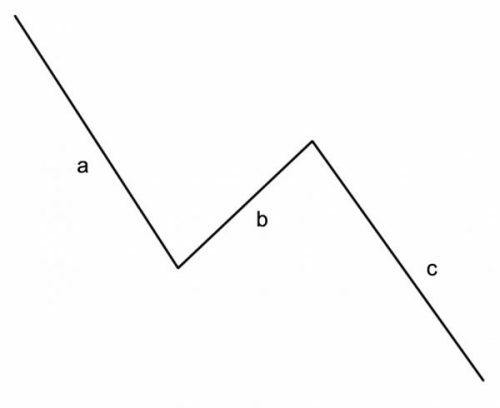 Wave “c” is the final price move downwards to complete the countertrend price move and falls further than wave “a”. Elliott wave followers study “a” and “c” waves for price ratios based on numbers from the Fibonacci series. It has been noted that most downward trends conform to this three-part pattern – an initial down move, a rally which generally recovers half of what has been lost and then a final down move which falls considerably further that the first down move.